An accurate measurement of the pressure is a fundamental aspect of all high pressure experiments, and there is a need for continuous development of new and better pressure scales. Pressure calibration has generally relied on the experimentally-determined equations of state or spectroscopic properties of internal standards such gold or ruby. In work appearing recently in Physical Review Letters, a research team that includes the Geophysical Laboratory’s Ronald E. Cohen, along with scientists from the University of Illinois at Urbana-Champaign, the University of California – Berkeley, and the Cavendish Laboratory has established a new pressure scale based on a high-accuracy solution to the underlying equations of quantum mechanics, which governs all material properties. In applying this first-principles approach, the group removed a key approximation employed in previous simulations, which has given their simulations an accuracy that rivals experiment. 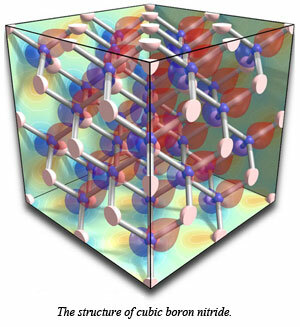 The group developed an all-electron quantum Monte Carlo (QMC) method for solids that does not rely on pseudopotentials, and used it to construct a primary ultra-high-pressure calibration based on the equation of state of cubic boron nitride. The static contribution to the free energy was computed with the QMC method, and the phonon contribution was then obtained using density functional theory, which yields a high-accuracy calibration up to 900 GPa, which is directly applicable to experiments. The anharmonic Raman frequency shift was also computed with QMC simulations as a function of pressure and temperature, allowing optical pressure calibration. This all-electron method is applicable to first-row solids, providing a new reference for ab initio calculations of solids and benchmarks for pseudopotential accuracy [K. Esler et al., Phys. Rev. Lett., 104, 185702 (2010)].